Update: I've had to cancel the race on August 31st, 2008. I have not been on the ball with preparations. Hopefully we will set a date for one in the future. In the interim, there is now another race in California. On October 11th there will be a race at Mammoth Mountain. 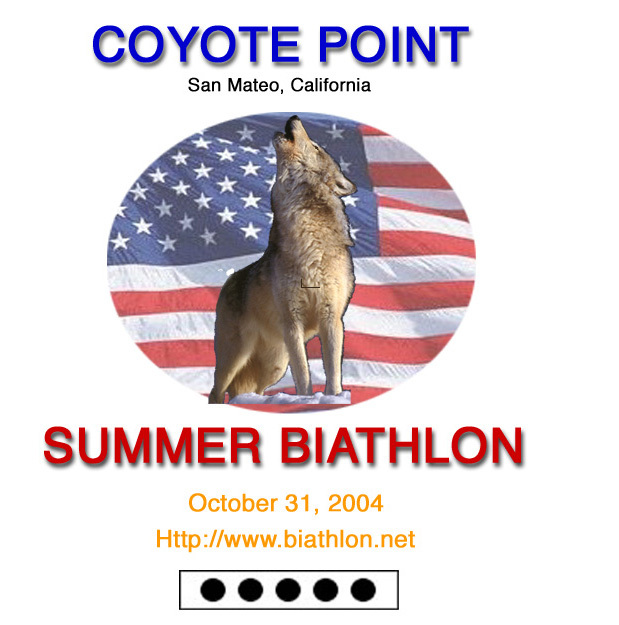 If you are not familiar with Biathlon, go back to the main page and read up on what Biathlon is all about. 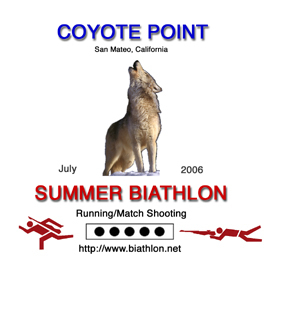 Format:The format of the Coyote Point race in particular is a one mile run, followed by prone shooting at five targets, followed by a one mile loop and then standing shooting , and then a final one mile loop. With the walk zone in the range, your total distance is pretty close to 3.1 miles, or 5 km, with an elevation change of roughly 150 ft total (50 ft on each loop - though you'll swear it is more! ). Because this race is geared toward beginners, the targets are set at roughly 25 yards, rather than the normal 50 meters. The targets are metal flaps that drop if you hit them. Rather than 100 meter penalty laps for every shot missed, we take the positive approach - you get to subtract time for every target hit - 15 seconds for every prone target, and 30 seconds for every standing target hit. So you have the opportunity to take as much as 3 minutes 45 seconds off your total time - which is your running time plus your shooting time (the clock is always running). Because we have a limited number of shooting stations and range safety officers (RSOs), we do a staggered start - e.g. I usually start a group of ten people at time zero, and then two athletes at a time every one or two minutes. Important info:The event start time is 8:40am. This is due to county regulations that require that shooting end promptly at 10am. Because we do not have flexibility regarding this end time, we may have to limit the number of entrants to assure that we finish on time. You will be required to sign an additional waiver form beyond the one on the race form when you arrive at the facility. This is a requirement of the County Sheriff Department, so be early if you can. Note: The range requires that you use hearing protection, and impact resistant glasses. If you have your own, bring them. Otherwise a (shared) set will be available at each shooting station. Finally, be aware that if you are under 18, a parent or guardian must be present for you to shoot. You must be at least 14 to shoot .22 rifles at this facility. Finally, due to a change in the insurance, you are required to be a member of the US Biathlon association. If you are not a member, one day memberships are available for $10. However, if you do more than two races in a year, it is cheaper to get a one year membership at $25. Forms for either option are available at race check-in. Costs: If you pre-register, the cost will be $25, which includes a t-shirt, range fees, and ammunition, as well as a shot at prizes. Because of insurance, you also need to be a USBA member to participate. One day USBA memberships are available for $10 - a form can be obtained here . Finally , you may be charged a $5 park entry fee if you arrive after the main gate is manned. Since it gets hectic just before the race, I'd advise you to try to zero your rifle (if you bring your own) prior to race day. The Coyote Point Rifle and pistol club (where we are holding the event) has public range hours from 7-10pm. MWF. The cost is roughly $5.00 for the three hours. The Club web site is here. Please call to verify those times. By the way, if you're not from the Peninsula, remember what Mark Twain said about San Francisco (which we're close to): "The coldest winter I ever spent was a summer in San Francisco!"... so make sure you're prepared for a cool foggy morning,especially if the inland valleys are predicted to be warm. Fog drip is a possibility but both the range and the clinic locations are sheltered. For an idea of what to expect, you can look at the results and pictures from the Sunday, 30 November 2003 race here. I am always looking for volunteers to help with the race (see the link below). Please feel free to email me! The Course - Trail map and pictures of the race course. Facilities - What your significant other can see and do while you race (or afterwards). Race registration form - This is the race registartion form in Adobe PDF format for the October 29, 2006 race. It is roughly 20k in size. USBA Membership form - A link to the USBA membership form. Picture Gallery - Pictures from previous races so you know what to expect. Volunteer job descriptions - What I need from you!